This photo still makes me laugh! I caught the cats trying to "help" my boy eat his breadroll, yes they wanted some of his breadroll... our cats are strange! 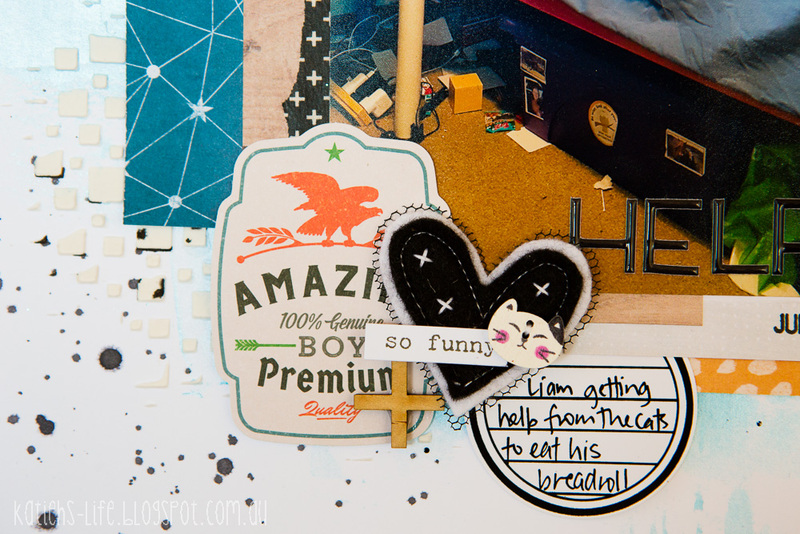 It was a bit of a challenge to scrap a photo this big, I am so used to 4x6 or smaller! But I am happy with the end result. Lots of Aussie products on this page too! Colour Blast, Cocoa Vanilla, Charms Creations, Rainbow Splendour, Burdy's Embellies and Flutterby Designs! Phew! What a line up! Of course I had to use a cat Charms Creations heart!! I don't think there are any of these left now, but you can still get all kinds of different hearts here. And how cute is the cat paperclip from Burdy's Embellies?! 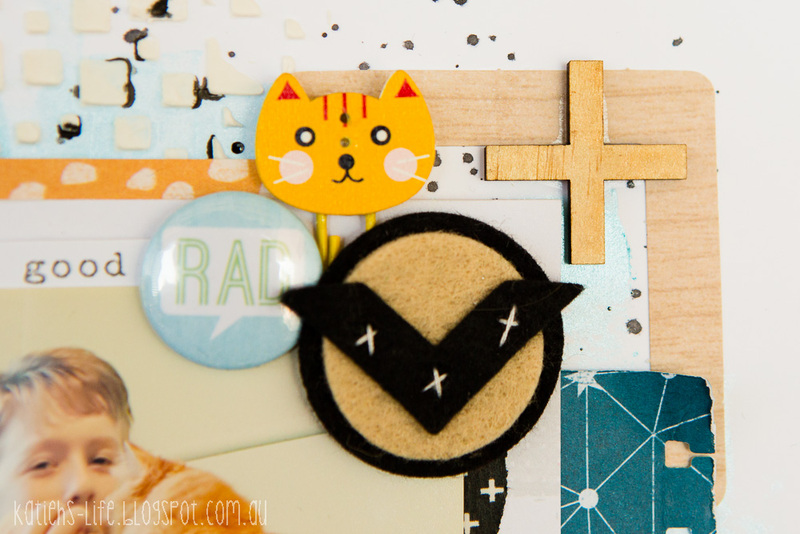 I love the felt chevrons from Rainbow Splendour too, so easy to use. So that is it for today, thanks for stopping by. Katie this is just so awesome! Love everything about it. Thank you for joining us this month at STB. Fabulous colour combinations Katie. Love the photo too! Thanks for playing along at Scrap the Boys. 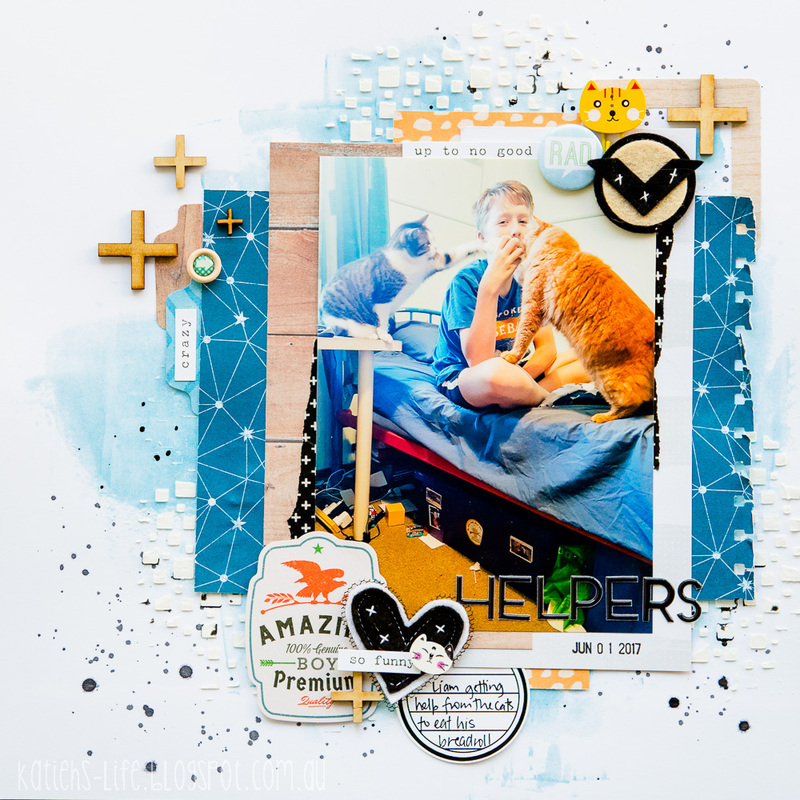 Fabulous layout, love the photo and the cat embellishments. Thanks for playing along with STB. BRILLIANT, love the big photo in this layout! Thanks for playing at STB!